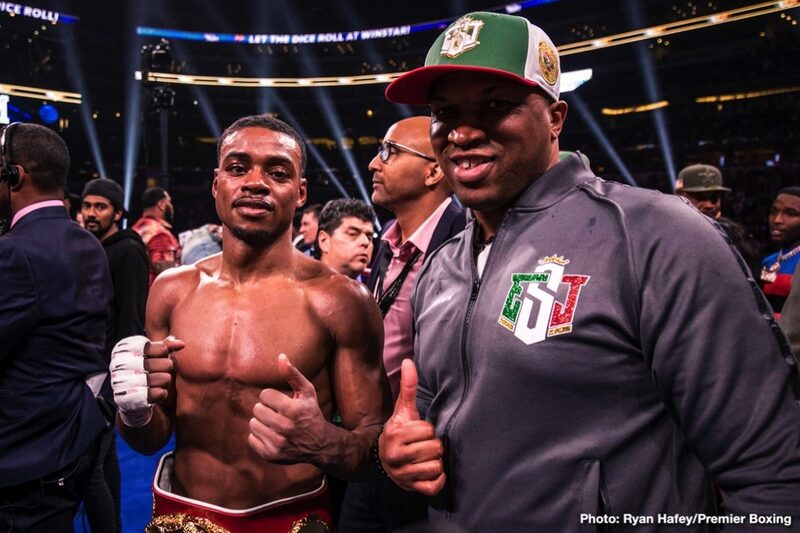 Errol Spence is clearly one of the hottest fighters on the scene right now. Seemingly closing in on stardom, of becoming as he puts it himself, ‘the face of boxing,’ the reigning and unbeaten IBF welterweight champ has fight fans all excited for his next fight. Looking quite superb, flawless even, against the too-small Mikey Garcia, Spence must pick on someone his own size in his next fight. The big one we ALL want to see is of course Spence against WBO welterweight boss and fellow claimant to the mythical pound-for-pound title, Terence Crawford. Hopefully this fight will not be left to ‘marinate’ on the shelf for too long (not that it’s likely either man will suffer a loss before getting it on with one another; as good as Spence and Crawford really are) and it will happen in either late 2019 or early 2020. As for who might be next for Spence, 25-0(21), two names have been put forth as possibilities: Manny Pacquiao, who holds a version of the WBA welterweight title and was at ringside for Spence’s dominant win over Garcia, and Shawn Porter, the WBC king at 147. Of those two, this writer would prefer to see Spence fight Porter in unification showdown next. It would be sad to see a 40 year old Pacquiao get embarrassed and beaten by Spence, which is what would be the most likely outcome even if Pac Man has shown he has a fair bit left in the tank whilst fighting in his fifth decade. Porter, who struggled mightily last time out, against the slick and tricky Yordenis Ugas, would also enter the ring against Spence as an underdog (who, Crawford aside, wouldn’t?) but at his best, when he has made the weight correctly and is at full physical strength, Porter can be a real handful for any welterweight. Never stopped, and beaten just twice, both times via close, debatable decision, to Kell Brook and to Keith Thurman, Porter could perhaps jump right on Spence and make it his fight. It would be interesting to see how Spence would react if Porter tried to rough him up, take it to the streets and basically take him out of his game; far more interesting than it would be seeing veteran Pacquiao trying to match Spence for speed. Of these two possible options for his next fight, the vote here is for Spence to fight Porter. Who knows, maybe Porter would bring out the best in Spence.